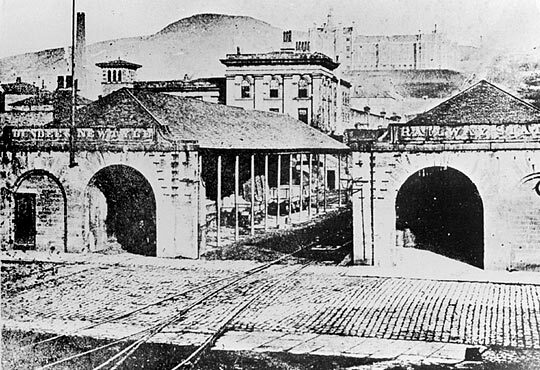 One of my early childhood memories was of my dad lifting me up to look over a wall to see the entrance of the railway tunnel “under” the Dundee Law - in fact it started just below the crest of a shoulder of the hill. That night, in my dreams, we found another entrance behind the High Kirk, which stands more or less directly above the tunnel, and we found an ancient steam engine in the middle of the tunnel. I think that, subconsciously, I was still searching for it when I later explored the tunnel, only to find its spitting image 40 years later and 400 miles away in the Canterbury Museum. The Dundee & Newtyle Railway's original southern terminus on Ward Road. 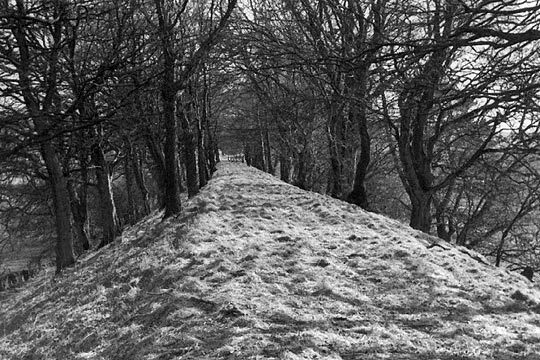 In the mid-1960s, I took a series of photos showing the remains of the railway which ran from Dundee to Newtyle. 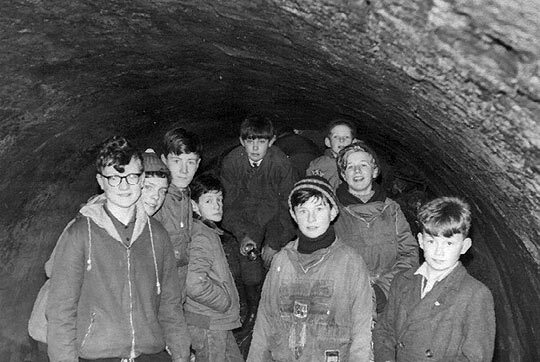 The stimulus to start looking for it - and particularly for the buried north end of the tunnel - was probably a conversation with the mother of a former school friend who said that, in her youth, it had been possible to walk through the tunnel, although she had never done so. I had heard that there were traces of the trackbed out in the countryside and, within the town, there were several buildings which sat at odd angles to the adjacent roads because they had been built to align with the track. I was surprised to find that one of these buildings was my father’s own printing works where I used to watch the steam trains shunting the trucks on the Fairmuir marshalling yard and another was the laboratory block at the Royal Infirmary where I started my career as a biochemist. The railway was fairly frequently referred to in the local newspaper, the Courier. Typical of these items was the following, which had found its way into the envelope in which I kept the photos. Did you know a railway train with a sail once ran from Dundee? One picture taken in 1898 showed a railway coach, with sail hoisted, approaching Ardler on the Newtyle to Coupar Angus line. On the track behind the train is the “driver” on horseback, ready with his mount to come into action. In these days a single coach made up the train. The railway company was formed in 1826 and in the following year tenders were invited for contractual engineering works. This was the first railway to be built in the north of Scotland. It was planned as a link between the manufacturing city of Dundee and the fertile valley of Strathmore. However it terminated at Newtyle which, at that time, was little more than a mill and a few houses, rather than Forfar or another of the larger Strathmore towns. The line was built with a 4 feet 6½ inches gauge - there being no accepted standard gauge at that time. It had several unusual features. Rather than going round them, Charles Landale, the engineer, decided on a policy of ‘up and over’ for the Sidlaws - a range of hills - and this resulted in three inclines, at Law (1:10), Balbeuchly (1:25) and Hatton (1:13). The inclines were worked by stationary steam engines. Initially the coaches and wagons were pulled by horses over the intervening level stretches of line. Later two steam locomotives were used although horses provided the back-up when the locomotives broke down. In its own way the railway was one of the most important early lines in Scotland, opening to traffic on 16th December 1831. It was the first not to rely on a coalfield for the bulk of its traffic, being built to connect the farming areas to the north of the Sidlaws to the harbour in Dundee, carrying general traffic in both directions. The railway was leased to the Dundee & Perth Railway in 1846 and became part of the giant Caledonian system in 1865. Standard gauge was adopted in 1849 and during the 1860s deviation lines were opened to avoid the three inclines, which then fell into disuse. The Law incline, captured in the 1930s, around 70 years after it was closed. The Law incline ran parallel and to the west of Constitution Street, through the grounds of the Royal Infirmary. The following details are taken from the Account of the Dundee and Newtyle Railway in The Quarterly Journal of Agriculture, Volume IV No XIX, 1833. 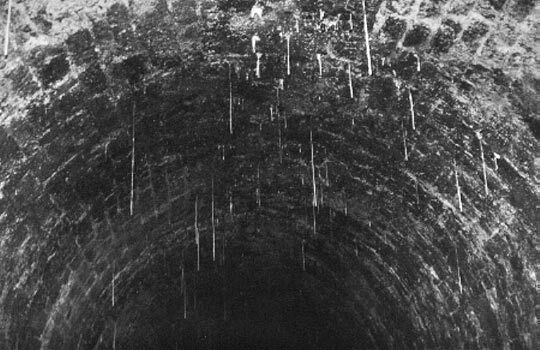 Stalactites hanging from the tunnel's masonry arch. 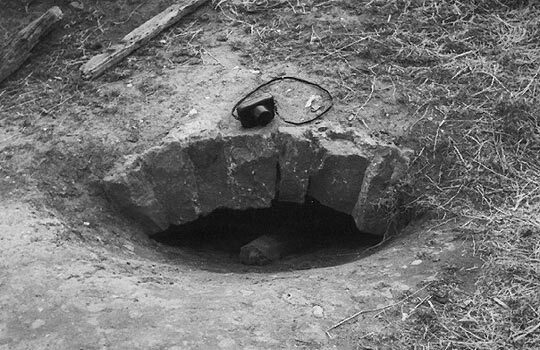 In the mid-1960s, ground movement caused the top of the tunnel's northern entrance to become exposed. 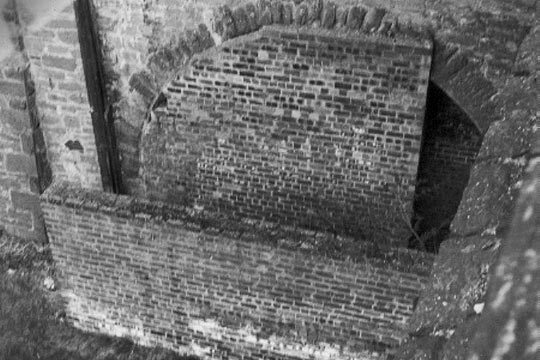 The south entrance was still open in the 1960s, tucked in below a wall at the top of Upper Constitution Street. It then ran under some allotments and between houses on the north side of Law Crescent. It was in some nearby allotments that my friend and I found the north end of the tunnel. It had been covered with rubble but over the years the ground level had lowered, revealing the top of the arch - and that gap was wide enough for us to get inside. A few minutes later we were at the south end, congratulating ourselves that we had achieved what his mother had not. The group of happy adventurers, going where no-one had gone for many years previously. A few weeks later, we returned in the evening with a group of kids from the Broughty Ferry Crusader Bible Class, where I was a leader. As we were crawling into the tunnel, three local lads came to see what we were doing. Rather than leaving them outside to report who-knows-what to who-knows-who, we took them - very willingly - along with us. The mound of rubbish inside quickly descended to the original tunnel floor level. Half way through there was a blast wall and on the north-facing side were the words “EMERGENCY EXIT”, so one assumes that the north end of the tunnel must have been open in the 1940s when it was used as an air raid shelter. Rails were still in place, said to have been laid for a narrow gauge track way used by a company which grew mushrooms in the tunnel. Hanging from the masonry lining were hundreds of stalactites. The narrow gauge track embedded in the tunnel floor. It is probably for this reason that there are several buildings which now appear to be out of align with the road system, because they were aligned to the track. One of these was the station master’s house in the grounds of Kings Cross Hospital on Clepington Road; another was Trendell Simpson, the printers in Lintrathen Street. This latter building was bought by my father in 1948 and the business has been in the family ever since. 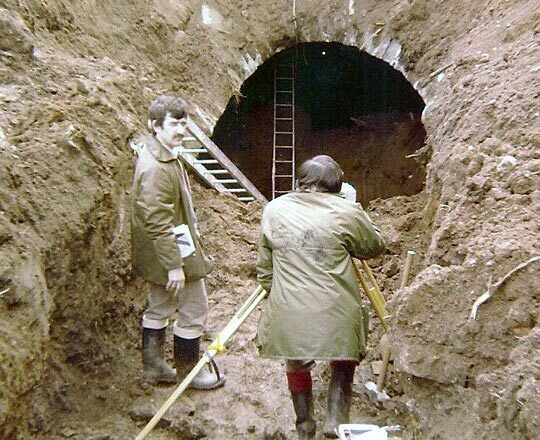 The northern end of Law Tunnel was exhumed in 1981 to faciltate a survey prior to the adjacent housing being built. In Priestley’s Navigable Rivers and Canals, the length of the first level section is given as nearly 4¾ miles. At the end of this was the second incline which took the line up a height of 200 feet over a distance of 1,690 yards. This was the Balbeuchly incline. It had a gradient of 1:25 and was named after the farm at the summit. The bottom end of the incline was at Rosemill. In 1966 there were two intact bridges, and another without its spans, which crossed the Dighty Water - the local stream - and a mill lade at Rosemill. The centre bridge led to the deviation line which was opened in the 1860s. Priestley’s Navigable Rivers and Canals gives the length of the second level section as being four miles and a furlong, with a rise of only 3 feet 9 inches. The track bed from the top of the Balbeuchly incline can be seen as a wooded embankment crossing the fields and meeting the end of the second deviation just to the north of Auchterhouse Station. The 1:13 Hatton incline at the northern extreme of the line, was the last of the three stationary engine-worked inclines to close, when it was superseded by a deviation line in August 1868. 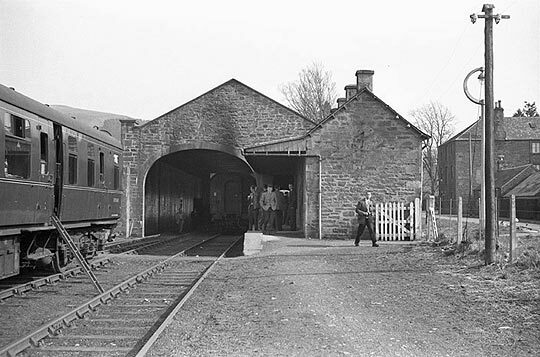 The station at Newtyle was the terminus of the Dundee & Newtyle Railway. In 1833 the line had 31,000 passengers, a number which had risen to 61,000 by 1839. In a very real way, the railway brought Newtyle into being. The 'Scottish Rambler' special, visiting Newtyle's original station in April 1962. In the Journal of Agriculture there is a series of calculations on the weight of crops, etc. which might be expected to be transported out of the Vale of Strathmore. There is also the following section which estimated the costs of running steam locomotives on the lines, rather than using horses. A view towards the summit of the Balbeuchly incline. In 1810, James and Charles Carmichael founded the Dundee company which produced the first locomotives for the Dundee and Newtyle Railway in 1833 - these were, in fact, the first locomotives made in Scotland. It is said that they were the first in the UK to have bogies. Prior to that, the company’s main activities were marine work, weighbridges and turbines. The first locomotive, No.1 and named Earl of Airlie, was delivered on 20 September and No. 2, Lord Wharncliffe, on 25 September 1833. These were the names of two of the local land owners who were principal share holders in the company. They were both 0-2-4s. The cylinders were placed on each side of the boiler; the crossheads above the cylinders were connected to large bell cranks, the longer arms of which were coupled to the connecting rods fastened to outside cranks on the leading 5 feet 4 inches diameter wheels. All wheels had laminated springs above the frames. The steam admission was by means of a valve on the boiler barrel, operated from the footplate by a handle and shaft. The feed check valve was on the side of the raised firebox. Early in 1834 a third locomotive was built by Stirling of Dundee to the same general design as the first two, and named Trotter. A fourth, called John Bull, was obtained in 1836 from Robert Stephenson & Co of Newcastle. Unlike the other three, this had the 0-4-0 wheel configuration. An extension of the railway onwards to Glamis was authorised in 1835, opening to goods in 1837 and to passengers in 1838. It was built by an independent company, the Newtyle & Glammiss Railway, the company using the old spelling of the village name. Around the same period, the separate Newtyle & Coupar Angus Railway opened. Eventually both of these railways were taken over by the Scottish Midland Junction Railway and used in part for the new route between Perth and Forfar, opened in 1848. Passenger trains operated on the Dundee & Newtyle from its earliest years. All trains were operated according to parliamentary regulations introduced in 1844. In February 1862, there was a service of three trains in the Dundee-Newtyle direction and four the other way, with a fifth on Fridays. Some trains were mixed, for both goods and passengers. Connections onwards from Newtyle to Coupar Angus, Blairgowrie, Alyth, Glamis, Kirriemuir and Forfar were available; also a service of short workings between Dundee and Lochee. By this date both the Law and Balbeuchly inclines were closed but trains would have required to use the stationary engine-worked incline between Hatton and Newtyle until 1868. The southern end of the tunnel was blocked off in 1982. Closure of the railway came in stages, with the section between Newtyle and Auchterhouse the first to succumb in 1958. 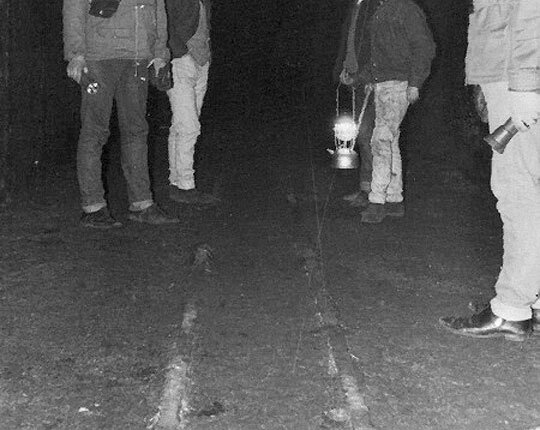 The rest survived into the 1960s but the history of the Dundee & Newtyle Railway ended on 6 November 1967 when the Law incline deviation line closed between Ninewells Junction and Maryfields Goods station. 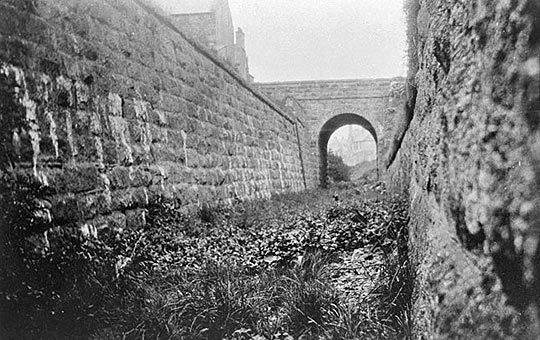 The north end of the Law tunnel was lost again when housing was built on the allotments where I had found it; the southern entrance was bricked up and buried in 1982. But however much it gets hidden, the tunnel will always remain in my memory thanks to the excitement of that underground adventure.